ABC apparently stands for Alcohol Board of Control. I don’t understand the need for euphemism, myself. But I suppose that’s part of the charm of the South. Or so I’m told. Also, there are specific rules in NC about what you have to buy in an ABC and what you have to buy in a supermarket. Generally, beer and wine in supermarket, anything harder in ABC. But what to do about fortified wines like vermouth or port? Both port and vermouth are fortified wines, but without the added herbs port has a very different character than vermouth. Port is also fortified with brandy rather than grain-neutral spirits. The end result is a dessert wine — sweet and heavy (relative to the wine you drank with dinner), it sits on the tongue a little bit. I do not have a beard or patches but my favorite dessert after a special meal is port with a few chocolates. As a mixer, port lends new character to drinks like the Manhattan or Americano. You can also use small splashes of it to add flavor and color to your Cosmopolitans or ‘Pomegranate Martinis’. I’ve even used a splash in a Chocolate Martini and dropped a raspberry in for garnish. But my favorite application of port in cocktails is the Stocking Stuffer. 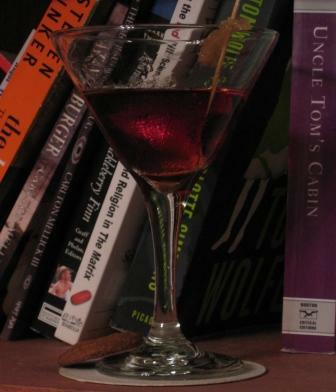 This is a Manhattan variation with spiced rum and port. And it tastes like a gingerbread cookie. Now I have to give proper credit: I am a golfer and my home course has a clubhouse bar named The Red Fox. Justin is one of the bartenders there and at one point was developing a new namesake drink. He came up with the below (or very close to it), and I fell in love with it. In the end, another mixture was chosen as ‘The Red Fox’. So I shamelessly turned the runner-up into my favorite holiday drink. Thanks Justin. I have tried a number of different ports for this drink and a simple 10 year tawny works great. While a vintage ruby porto is very good, it just isn’t worth it (to my wallet). The return on investment drops too quickly. More important is the choice of spiced rum. Sailor Jerry and Captain Morgan are the 2 most common spiced rums in the U.S. Although recent entrants like Cruzan 9 or Bacardi OakHeart may take part of this market, the Captain has a near-monopoly — it is the second most popular liquor by volume in the United States. Interestingly, none of these have long roots. Captain Morgan was introduced to the U.S. in 1984, and Sailor Jerry in 1999. Most recently a very dark spiced rum called Kraken hit the shelves. It is quite different from the others and while it makes a very good drink if substituted, it is very different from a traditional Stocking Stuffer so I would probably call it something else. But try it if you’re interested. Captain Morgan and OakHeart are 70 proof liquors, while 9 is 80 proof and Sailor Jerry is 92. Yet the Sailor has more vanilla and spice flavor and actually tastes less ‘hot’ than the others. Definitely a fuller, rounder flavor – like the spices were really infused in the alcohol rather than added afterward. And they all have a similar price (Sailor $2 cheaper than Morgan in my ABC) so the Sailor is my spiced rum of choice. Combine in glass side of shaker and stir for 30 seconds. Strain into chilled cocktail glass and garnish with a candied ginger strip or a ginger snap cookie. Or both. I will say that the difference in the Stocking Stuffer is subtle, so don’t throw away your bottle of the Captain just for this drink. But I would recommend that the next bottle you buy, check out the Sailor. It makes a phenomenal Cuba Libre (rum and coke); at a 1:2 ratio Sailor and Diet Coke with a lime tastes like an old-fashioned fountain Vanilla Coke. You know, the kind they don’t have anywhere anymore. Critical to this drink is the Grand Marnier and the bitters. It is definitely the combination of spiced rum and bitters that gives this drink its gingerbread flavor, and the port and orange liqueur add sweetness to it. Please do not use Triple Sec — most are WAY too sweet and throw off the drink. You can use Cointreau successfully if that’s what you have in the house. Garnish-wise, the original didn’t have one. But I will sometimes garnish with a candied ginger slice on a toothpick. These are available or a few dollars in the International aisle of your supermarket. They even have them in NC. But my favorite ‘garnish’ is to serve it with is a small, crisp ginger-snap on the side. Serve it on the rocks after shaking it. You’ll get even more melted ice that way. OR: add 1/4-1/2 oz of egg white to the shaker, shake extra long and serve up. This will make it creamy and mute some of the strong flavor. I’ll call this one the Creamy Stocking. This entry was posted in Uncategorized and tagged Bitters, ginger, port, spiced rum, Stocking Stuffer. Bookmark the permalink.